Luton chief executive Gary Sweet has confirmed the club will receive a 'very healthy' boost to their coffers after former striker Jack Marriott joined Derby County from Peterborough United this morning. The 23-year-old moved to Pride Park from the Posh for an undisclosed fee thought to be upwards of £4m after a prolific campaign at London Road which saw him score 33 goals in 56 games. 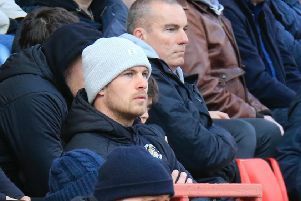 Marriott had joined Peterborough from the Hatters last summer and on whether Town boss Jones would be given any of the funds to further strengthen his squad ahead of the League One campaign, Sweet said: "We've already invested considerably in capturing Nathan's top three targets without the guarantee of any income. "Any incomes from the Marriott sale will filter into our account over a fairly lengthy period so this will go towards providing further stability for both the football club and the development company." New Rams boss Frank Lampard was thrilled with his latest capture, telling the Derby official website: "I’m delighted that Jack has chosen to join Derby County and I believe this is another great addition to our squad. "Goalscorers are always sought-after and Jack certainly has been in demand. "He scored an incredible amount of goals in League One last year and, at 23, we know he can still develop and get better too. “He certainly strikes me as a player that is really determined to improve.